The Hornets enjoyed a FA Cup classic on Saturday as they edged a seven-goal thriller to advance into the third qualifying round of the historic competition. They pocketed £9,000 as they came from 2-0 down to beat Heybridge Swifts 4-3 and set up a home tie with Southern League Premier Division South side Poole Town on October 6. Horsham are back in knockout action on Saturday with a long trip to Bury Town in the FA Trophy preliminary round. They have already been knocked out of the Velocity Trophy with a 3-1 defeat at Bracknell Town but will soon also be in Sussex Senior Cup action as well. With eight weeks gone in the season and six Bostik League South East Division games played - with a return of two wins - that has meant a busy start. And while Di Paola is a fan of the FA Cup in particular, especially given Horsham’s rich history in the competition, he has hinted he is aware they have been unable to build any league momentum. 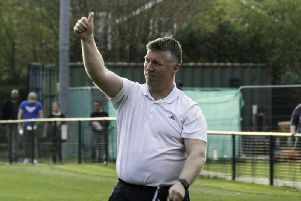 Tuesday night’s 2-0 defeat at Hastings United was the first time this season the Horsham boss has criticised the performance. He has been pleased with the majority of their efforts in defeats, but is keen to start kicking on in the league - staring at home to Phoenix Sports on Tuesday night. Di Paola said: “We have three wins on the board so far and it’s been a good start in my eyes. “I love the cups, but sometimes I do not think it helps teams’ league form - you really need to put a run of league games together without the breaks. “We have had the Velocity Trophy, League Cup, FA Cup and FA Trophy now this Saturday. We have to be mindful that we do need to start getting some results in the league. “I think we will be absolutely fine, I have seen enough and we have done well so far. Tuesday was the first game that I felt we were off the pace - we have had bad little spells in games, but that was on the whole. “We have the Trophy game Saturday which is a long old trip to Bury and that’s a different challenge. One player they will be missing is Lee Harding, who after a run of decent performances, is ruled out with a fractured wrist. Although they have signed former Chipstead defender Dylan Merchant, who was at South Park last season. Di Paola added: “We needed a bit more cover at the back and Dylan became available. If he does well he will stake a claim as he is a good player in his own right.